While in Portland last week we went to a restaurant called Lovely's Fifty Fifty. It's not a vegan restaurant, but the chef prepared for us a vegan pizza that was out of this world. The pizza was wood fired and was covered with chanterelle mushrooms, grilled winter squash, radicchio/escarole and a red sauce that brought it all together. The flavors were amazing and I was so glad that they didn't use any fake cheese products on the pizza. The food was fresh, seasonal, organic and even though they are not a vegan restaurant, they had no problem creating a special dish for us--that's what I love so much at Portland. You can basically eat anywhere and find vegan options on the menu, or the chef/cooks will create something delicious for you. In addition to the pizza, we ordered a wonderful appetizer made with roasted cauliflower, currants, golden raisins and pine nuts. 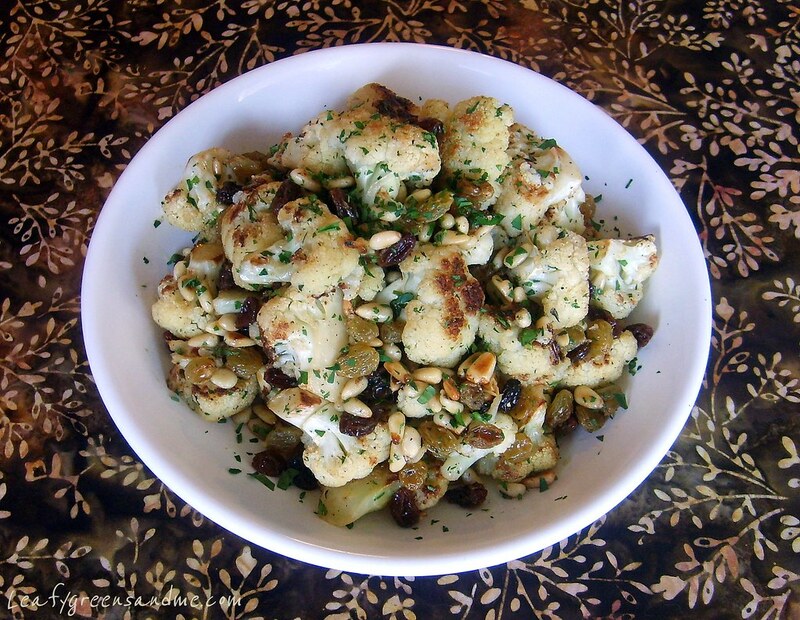 Cauliflower, raisins, pine nuts/almonds are a match made in heaven and I thought that it would be a great side dish (not to mention super easy to make) to serve at Thanksgiving. Toss cauliflower florets with olive oil, thyme and salt and pepper and roast in the oven for 15-20 minutes until golden brown, tossing half-way through the cooking time. Remove from oven and place in a large bowl, along with currants, golden raisins and pine nuts. Add warmed sauce, parsley and toss to coat. While cauliflower is roasting, add vegetable stock, garlic and thyme to a small sauce pan and reduce to a 1/4 cup. Add lemon juice to taste and whisk in olive oil. Season with salt and pepper and keep warm until ready to use. This will be a definite try in my upcoming week. I am also getting info from Neil Barnard's 21 Day Vegan Kickstart where he and his team give a 3 week menue for newbies with shopping list and all.